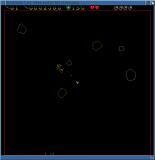 Description: SDLroids - Asteroids clone. 'Alt-Enter' switches between window and fullscreen. Read the Html for the details.